Stanley, Stephen, Simon, and Susan Mouse loved to listen to their granny’s stories. 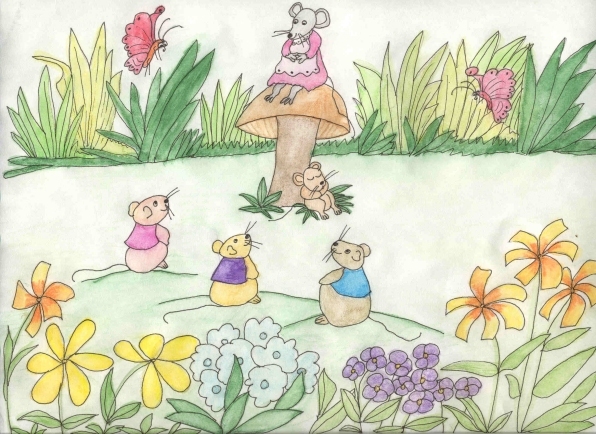 She told them about her life as a wee mouse and her adventures with Angus, the cat. One bright sunny morning Granny asked her four grandchildren if they’d like to go into the flower garden and listen to a story. "I want to go, Granny," squeaked Stanley. "Can we sit by the toadstool?" Susan asked. Simon yawned and said, "I’m sleepy, but I’d like to hear a story, Granny." They followed her into the garden. "It smells nice in here," Susan said. "It’s pretty. Look at all the flowers," Stephen smiled. Granny climbed on top of the toadstool and sat down, dangling her legs over the edge. "Gather round and I’ll tell you a story." Stephen, Stanley, and Susan sat on a mound of grass. Simon lay against the toadstool. "I’ll listen from here," he yawned. Granny smiled. She knew he’d fall asleep, but the others would listen. "A long time ago, when I was a wee mouse like you all are, I was living way up in the highlands of Scotland. It was very cold." "Was there snow, Granny?" Susan asked. "It snowed all the time, but it was so windy that most of the snow blew across the land and didn’t stick to the ground." Susan shivered and Granny continued, "One morning I woke up and it was so cold that icicles were hanging from my mouse hole. I was wondering if I was going to get any cheese that day. Usually when it was a cold morning like that, Angus would stay near the house so he could drink his milk before it froze into a solid block." "Did his tongue freeze in the milk?" Stephen asked. Susan and Stanley giggled. "That would be funny," Stanley laughed. "I never saw his tongue frozen in the milk, but I wish it had of. He was an angry cat. All he did was meow and snarl and he had a bit of a bad temper. This morning he was angrier than usual. I watched him drink his milk. Knowing he’d be there a few minutes, I used this time to run around the back of the croft and see if there was any cheese in the bin. I climbed up to the top and ran inside." "Was there any cheese, Granny?" Susan asked. "There were a few bits, but not enough for a mouse on a cold, wintry day. I was nibbling away on the cheese when a dark shadow spread across the bin." "What was it, Granny? Was it Angus, the cat?" Stanley gulped. "It was Angus all right. I was trapped in the bin. I had no way out. I didn’t know what I was going to do," Granny said. "Och no, Granny, what did you do?" Stephen asked. "Did the cat eat you?" Susan squeaked. "How could the cat eat her, Susan? She’d not be here today if he had, silly," Stanley said. "Just as Angus was about to grab me with his sharp claws, a huge icicle fell off the croft and landed on his head. He fell off the bin and lay still. I ran up to the top of the bin and looked down. I thought Angus was dead. There he lay, with the broken icicle all over him." "Were you glad, Granny? Were you glad he was dead?" Susan asked. "He wasn’t dead. He was only knocked out. I grabbed all the bits of cheese and ran around to the front of the house. I pushed the bits into my mouse hole and then do you know what I did?" Granny asked. "No, Granny. What did you do?" Stephen wondered. "I went over to Angus’s bowl and drank all of his milk. It was starting to freeze so I had to hurry. I drank every last drop," Granny chuckled. "My tummy was so full. I knew I’d not be hungry for days and days." "That’s funny, Granny," Stanley said. "Did you have milk on your whiskers?" "Lots of it and I loved it," Granny laughed out loud. "That was a good story, Granny. Too bad Simon slept the whole time," Susan said. "There’s always tomorrow," Granny said. "Let’s go home now. Your mum has some cheese for you. I’ll wake Simon up." Granny slid off the toadstool and shook the wee mouse. "Simon! Simon, wake up." Simon yawned and opened his eyes. "Did I miss the story, Granny?" he asked. "Yes, you did. Maybe you can hear tomorrow’s story though. Come on now. We’re going home," Granny said. She took their hands and they walked home together, looking forward to a big piece of cheese.